Lights in Cateye's Reflex series all share an identical design, featuring a large reflector with LEDs embedded in the center. There are two versions of the Cateye Reflex. The normal version is like any other light, and the Auto version has a built-in darkness and motion sensor which will trigger it to turn on automatically. Aside from this, they are identical. The Reflex series is essentially a giant reflector with some LEDs inside. The intensity of the LEDs was rather disappointing - unlike the other Cateye products I tested, these did not have a high-power LED, and only put out 930 lux straight-on. The battery life is decent though, lasting 74 hours like the Rapid 5. Although this light isn't the brightest, and I wouldn't recommend it as the sole light on a bike, it does come with a nice variety of mounting options, including a rear rack mount, a seat post mount, and a stay mount. The rack mount has holes for almost any setup, and has a nifty lock feature which lets you insert an extra screw to prevent the light from being easily removed by thieves. The auto feature worked surprisingly well on the version which includes it: Even when it was only slightly dark, such as around dusk or during a rainy day, it would always turn on when needed. Now, for somebody who already has several other lights which are not automatic, there is not much benefit - I actually found it rather annoying, because I like to turn on my light even during the day sometimes, and there is no way to force the light on (although you can turn it all the way off so it doesn't come on in your pack while walking around). There is definitely a market for the auto feature though - if somebody rarely bikes at night, or maybe is apt to forget to turn their lights on, this may be a good choice, because it's easy to "set and forget," especially with the anti-theft rack mount. The Cateye representative I spoke to said they particularly recommend it for children who might not remember to turn on their light. I agree that it would be a good setup for younger riders who are not frequently out at night, but who need a light just in case. 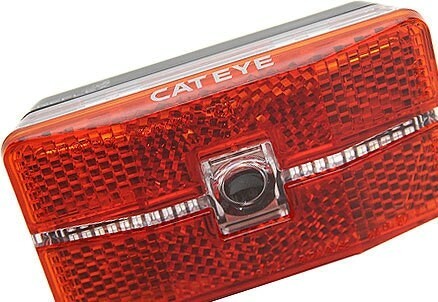 This light might not be the best choice for commuters in busy traffic or people who bike at night frequently though - Cateye's other lights are much brighter at a lower cost.